Dr. Lorelei Ioana Nassar, born in 1968, in Bacau Romania, graduate of Faculty of Stomatology, University of Medicine And Pharmacy, Iasi, Romania. 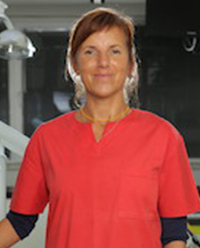 Dr. Lorelei Nassar is a dentist with over 25 years experience in oro-maxillo-facial surgery and implantology. With more than 10,000 implants and major specializations in implantology she is an active surgeon in Romania but also in Israel, Sweden, UK, USA where she operates and revolutionizes dentistry through unique practices and demonstrations. She is one of the few dental surgeons in the world who practice medical hypnosis. She organizes international courses and congresses on surgical topics, participating as a lecturer also in UK, Sweden, Finland, China, Mexico, USA, Israel, where she provides specialist support and training to surgeons in the field of implantology. She has written numerous articles in the Romanian press, off and on line, on topics related to dental prevention, medical hypnosis, dental fear and treatment, non-verbal communication and has participated in numerous TV and radio shows in recent years.